The term ‘post-digital’ was introduced by Kim Cascone in 2000 to describe the rapidly changing relationship between humans and technology and the resulting aesthetics of digital failures and errors, like what has become to be known as ‘glitch art‘ (Andersen & Pold 1). Following the initial fascination with seemingly endless possibilities offered by digital technologies and the utopian visions of ‘high-tech’ future, the enchantment decelerated. While Kim Cascone’s remarks regarded audio and visual techniques of the time, the term ‘post-digital’ is now used in broader sense to encapsulate the artistic practices that reflect on human-machine relations in modern world. More pragmatically, the term ‘post-digital’ can be used to describe either a contemporary disenchantment with digital information systems and media gadgets, or a period in which our fascination with these systems and gadgets become historical (“What is “Post-Digital”?”). The post-digital print, then, is a critical response to the disillusionment with the digital. In other words, through materiality, the post-digital print strives to re-invent books as medium. In practice, the materiality of the book becomes its strength and area of artistic exploration. Book, as a material form, is given a chance to enhance the experience or reading and emphasise its distinct features. In simple terms, post-digital aesthetics can be understood as an opposition to general “high-tech and high-fidelity cleanness” (“What is “Post-Digital”?”) of ‘advanced’ technology. In case of books I shall describe in this post, it will become evident that, in Adema and Hall’s words, “the medium of the book plays a double role in art and academia, functioning not only as a material object, but also as a concept-laden metaphor” (Adema and Hall 2). 1. A cybernetic industrial infrastructure integrating and handling production, distribution, exchange and consumption is developed around the product. 2. The consumption is controlled through programming that closely monitors consumer behaviour and the effects of marketing through tracking and surveillance. 3. Controlled obsolescence is programmed into the product, limiting the functionality and durability. 4. The overall effect of controlled consumption is a significant reorganizing and troubling of specific practices of everyday life (Striphas 180-182). Encyclopedia Rebound : A post-Virtual Mass of Random Information is an artistic project by Sue Sommers, initiated in 2012. As the artist herself remarks, Encyclopedia Rebound is an “analog version of web search experience”. The books in question consist of cut down, shuffled, and re-bound pages of Encyclopedia Americana (1960). As the title suggests, the project reflects on the nature of the Internet, namely the information overload. Another motif one could identify in the bookwork is the reflection on the obsolescence of print as a carrier of encyclopedic knowledge. 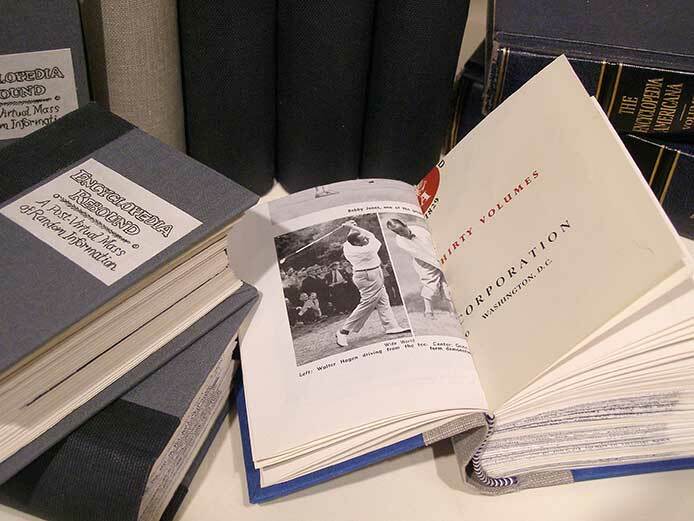 As Florian Cramer points out : “The web has largely discarded books for periodically updated reference works, such as telephone books, bibliographies and encyclopedias (“Bound to be a Book” 73). Piece 2: Backup of Jesse England’s e-book copy of 1984 by George Orwell. Backup of Jesse England’s e-book copy of 1984 by George Orwell. Backup of Jesse England’s e-book copy of 1984 by George Orwell is stunning with its simplicity. The project, while not engaging with artistic practices like other examples in this post, take a different approach to materiality nonetheless. In this example, the author reflects on the medium itself and its stability in current mediascape. In other words, the author wanted to bring closer attention to the issues of control of digitized cultural objects. The excerpt above describes the circumstances that inspired the author to create a ‘back up copy’ of his 1984. The fact that one of the books ‘missing’ from users’ Kindles was George Orwell’s dystopian 1984, adds an ironic twist to the whole situation. Referring back to materiality, in this example a paper copy serves as an ‘independent’ copy, devoid of DRM and control of the ‘Big Brother’. As Mark Poster explains, digitized cultural objects are subject to different limitations than the ‘fixed’ ones. Fixed cultural objects like books afforded certain advantages to consumers. The consumer, having bought the book, could read it anywhere he or she chose. The consumer could lend the book to a friend or resell it. The consumer could copy the book by handwriting and later photocopying machines, which, though illegal, is impossible to police (Poster n.pag). ard-winning art director and graphic designer. 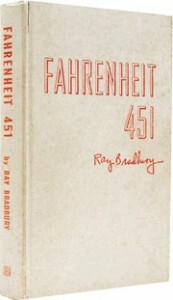 In contrast, a limited series of 200 copies bound in fire-proof asbestos were released shortly after the first edition in 1953. 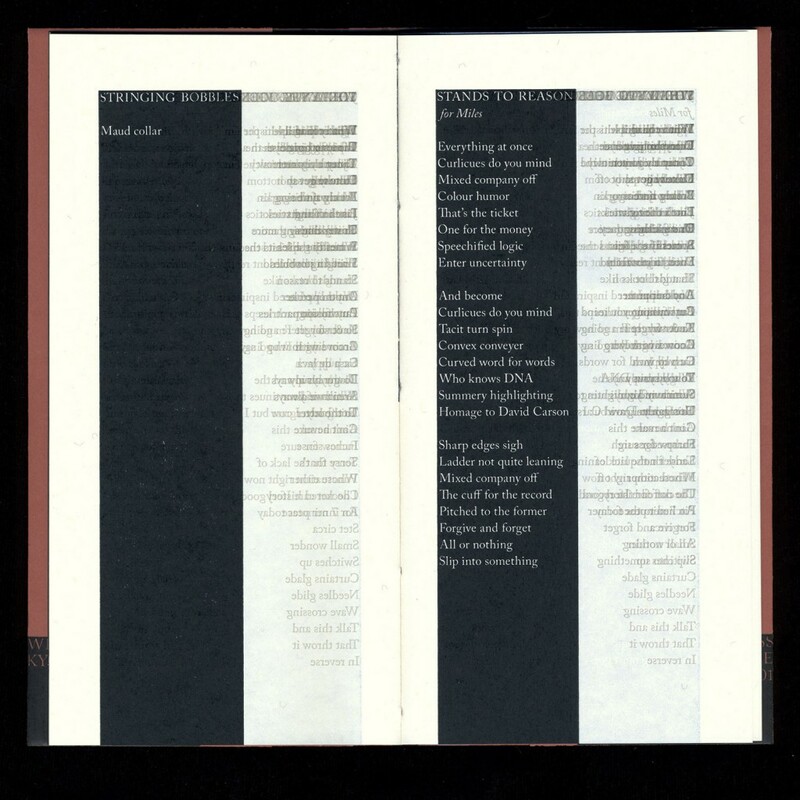 This reflexivity of the book with regard to its own nature is one of the key characteristics that make a book an artist’s book, and enable it to have political potential in that it can be ‘rethought to serve new ends'” (Adema and Hall 10; original italics). A pop-up alphabet book, designed by LA-based illustrator and artist Victoria Macey. 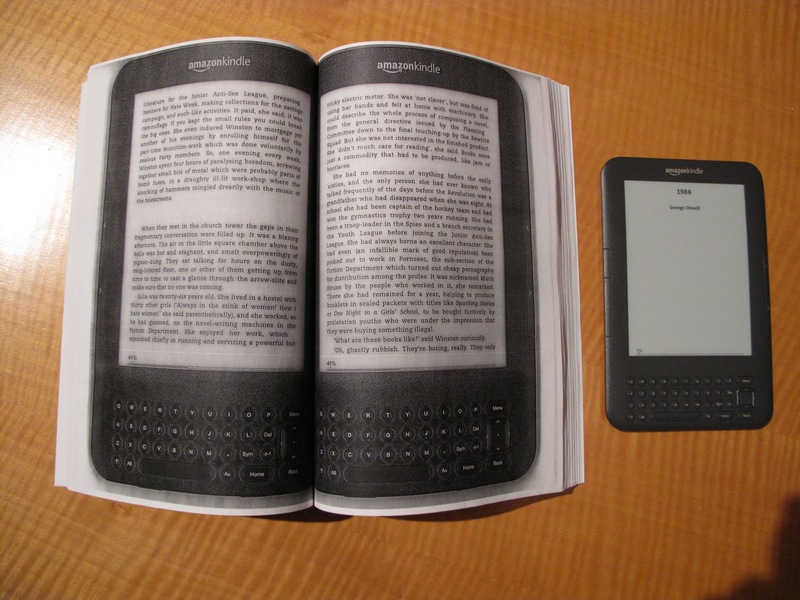 I believe this example of post-digital book has more to it than it would seem at first glance. It plays with letters and employs them in new, creative ways. Adema and Hall refer to theories of Ulises Carrion and argue that a book is “a specific set of conditions that should be (or need to be) responded to. Instead of seeing it as a text, Carrion positions the book as an object, a container and a sequence of spaces” (Adema and Hall 11). In case of Bodoni Bedlam, the eponymous font, Bodoni, is re-purposed to serve as element of illustrations for the story. Foregrounding font name can be seen as a reflexive measure as well : identifying the font brings up potential connotations associated with it. In case of Bodoni, for example, the constraints of the design lead to legibility degradation in some digital devices (Wikipedia). 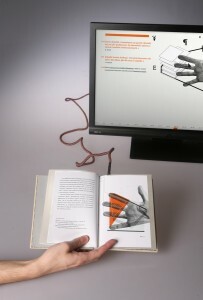 A hybrid book project, consisting of a website (www.elektrobiblioteka.net) and a 32-page book, which serves as a navigation tool for the website. At the same time, however, both can be used separately as standalone publications. It was designed and developed as a master’s thesis project by a Polish arts student Waldek Węgrzyn in 2012. It discusses a range of New Media related subjects, from graphic interfaces to digitization of knowledge. The project is ultimately creative and innovative. 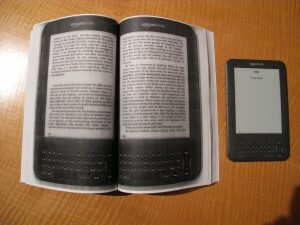 The book is enhanced with electronic elements and is designed to be connected to a computer. The hybrid nature of this bookwork, although futuristic, illustrates the notion of media convergence, bringing the ‘old’ and ‘new’ media together. What You Will is a collection of poems by Kyle Schlesinger, a poet, printer & book scholar. The project is an effect of collaboration of the poet and an independent publisher of experimental writing and artists’ books, NewLights Press. Through its design, What You Will reflects on the process of printing using letterpress and the linearity of codex reading. 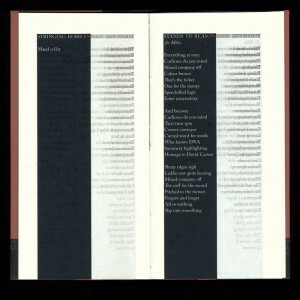 The poems are printed in printed in negative text in the black columns, and the successive layers of mirrored text printed in gray are to the right. 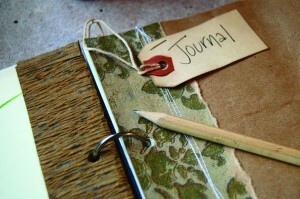 Paper not only offers a medium to communicate, but a tactile experience which can enhance the communication process. I think the growth of technology and social networking only makes paper and things printed more precious. The very materiality of paper is given the focal point in this bookwork. It is made from recycled paper scraps, tree wrap, stitched pages, paper sacks, envelopes, masking tape and handwritten headings. Last page is a folder with linen tape closure. 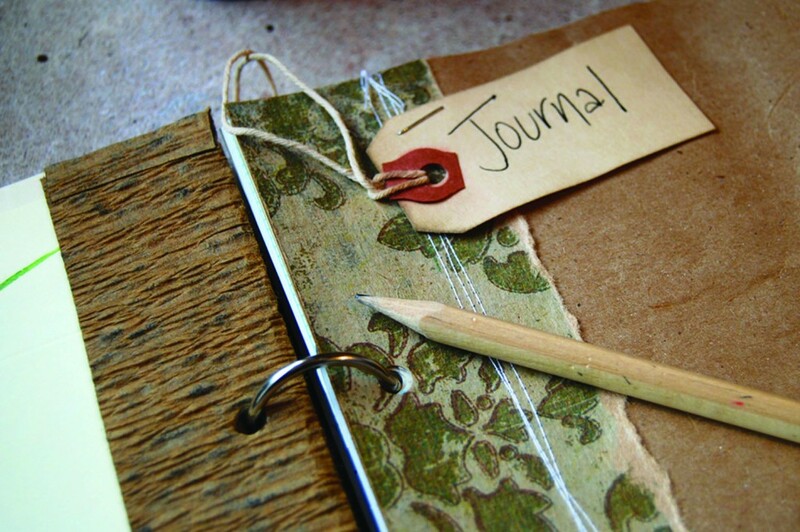 Through the use of recycled materials, Journal explores another aspect of materiality – its potential to last and therefore gain emotional value. In other words, pieces of various materials utilised to produce this object were previously elements of different artifacts, or, as goes for masking tape, had different agenda. Adema and Hall described the book as a medium capable of raising “questions for some of the established practices and institutions surrounding the production, distribution, and consumption of printed matter”(Adema and Hall 14; original italics). This blog post analysed the notion of post-digital materiality in print bookworks. In famous words of Marshall McLuhan, “the medium is the message” – the materiality of print publications serves as an area of artistic exploration. By exploring materiality, authors of above-described bookworks created reflexive loops regarding questions of fixation of the medium, or its political potential. Sue Sommer’s Encyclopedia Rebound aimed to re-purpose old encyclopedia as an artistic vision of the chaotic nature of web search. While the accuracy of that portrayal is questionable, her work emphasises the out-of-date nature of print encyclopedias as a source of knowledge. Jesse England’s back up of 1984 aimed to bring into question the notions of control over digitized cultural objects and the power relation, or simply imbalance, between a consumer and the distributor. 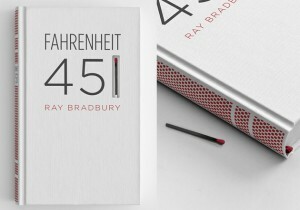 Fragile nature of books, but most importantly its importance as a carrier of knowledge, is embodied by Elizabeth Perez’s design for Ray Bradbury’s Fahrenheit 451. Victoria Macey’s Bodoni Bedlam offers an experience of reading impossible to achieve by digital means, while at the same time subtly playing with the eponymous, standardised font. Elektrobiblioteka illustrates the almost endless possibilities of experimentation with medium that are a hallmark of the post-digital, as Cramer understands it. What You Will explores the printing process through abstract aesthetics. Finally, Peg Churwell uses different textures to cherish the experience of paper. All these approaches to materiality contribute to exploring the ‘outdated’ medium and contribute to its re-invention. “Bodoni.” Wikipedia. Wikimedia Foundation, 05 Nov. 2014. Web. 19 May 2014. Cramer, Florian. ‘Bound to be a Book: Towards Print as Multimedia and e-Books as Paperbacks’, in Joost Kircz and Adriaan van der Weel (eds) The Unbound Book, Amsterdam: Amsterdam University Press, 2013, pp. 71-79. Pressman, Jessica. ‘The Aesthetic of Bookishness in Twenty-First Century Literature’, Michigan Quarterly Review 48.4 (2009): 465-482. Poster, Mark. “Who Controls DIgital Culture?” Fast Capitalism. Web. 19 May 2014.